SIMPSON BAY, St. Maarten (February 9, 2014) Some 270 students spread across the seven public schools on St. Maarten will benefit from the Princess Juliana International Airport’s (SXM) HealthFast Breakfast in a Box pilot program, which was launched at the Prince Willem Alexander School last Friday morning. “A Serving of Smarts” is the theme of the program. 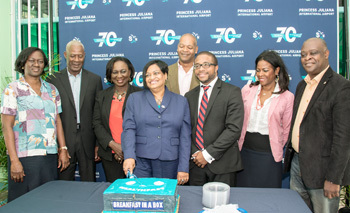 The project, conceived as part of the ongoing celebration of the airport’s 70th anniversary, is expected to cost over a quarter of a million dollars (exactly US$271,338.80) in its first year or US$1,214.35 per day including delivery. Three cabinet ministers attended and spoke at the event. Minister of Education, Culture, Youth and Sports, Hon. Patricia Lourens-Philip, Minister of Health, Labor and Social Welfare, Dr. Cornelius de Weever, and Minister of Tourism, Economic Affairs, Transport and Telecommunications, Hon. Ted Richardson, who also has responsibility for the airport. Also in attendance were president of Parliament, drs. Gracita Arrindell and MP Romain Laville, who addressed the gathering, reading from the motion he had tabled on the floor of Parliament a long time ago concerning a breakfast program for schools. While the ministers expressed satisfaction that the pilot program was getting off the ground, they also praised the management and board of SXM for their initiative, which shows that they take their corporate social responsibility seriously, and called on others to jump on the bandwagon so that the program could become permanent and expand to include all the schools on St. Maarten. 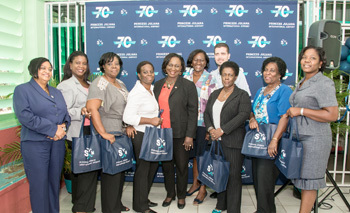 “This is why, as part of the celebration of our 70th anniversary, we decided to launch a program entitled ‘HEALTHFAST: Breakfast in a Box’ for public schools as a pilot program, which we hope will eventually become permanent, with the collaboration and participation of other government-owned companies and private sector entities,” she added.